The list of banana health benefits is too long to cover in just one article — but here are the top 6 that keep me reaching for bananas day after day. As a fruit, a banana is incredibly convenient to pack in a lunch, travel with, and eat while you’re on the run. When you discover everything that bananas have to offer, you might want to run out and get a bunch! #1 – Bananas are a good source of energy. Bananas contain potassium — which helps with the production of energy. Bananas are also a source of the sugars glucose, fructose, and sucrose. Glucose and fructose are are absorbed into the blood rather quickly — which will give you quick energy. Therefore, you should eat a banana or two before a workout if you want a quick boost of energy. #2 – Bananas can improve your mood. Bananas contain tryptophan — which is converted into serotonin (a brain neurotransmitter that improves your mood and reduces mood changes, depression, and anxiety). Eating bananas will help you to feel confident and relaxed. #3 – Bananas improve your vision. Bananas contain enough Vitamin A to help protect your eyes. Specifically, Vitamin A maintains good vision and improves night vision. Vitamin A also contains compounds that preserve the membranes around your eyes and help to prevent macular degeneration. #4 – Bananas are rich in antioxidants. Antioxidants prevent the oxidation of cells — which can help prevent diseases such as cancer and also fight the signs of aging. Antioxidants also protect your heart against heart disease and your brain against dementia. #5 – Bananas contain fiber. A 6-inch banana has approximately 2.5 grams of fiber. Fiber is beneficial for keeping you regular — which keeps the digestive tract healthy. Adding fiber-rich foods to your diet can also make you feel fuller for longer periods of time — so you may eat less can even lose some weight. #6 – Bananas contain vitamin B6. Vitamin B6 helps to maintain proper blood sugar levels and healthy blood. It also boosts your immune system and fights fatigue. In addition, B6 plays a role in hormone control and can relieve PMS symptoms and emotional disorders. As you can see, one simple banana has a boatload of benefits for your body and your wellbeing! Here’s a list of even more banana health benefits. Perhaps the best part about bananas is they’re just as good for you when they are “old” and overripe! I always keep bananas in my kitchen, as a grab ‘n go healthy snack during the day, before bed, or when I’m heading out the door. Sometimes I don’t eat them all before they’ve turned brown and mushy. 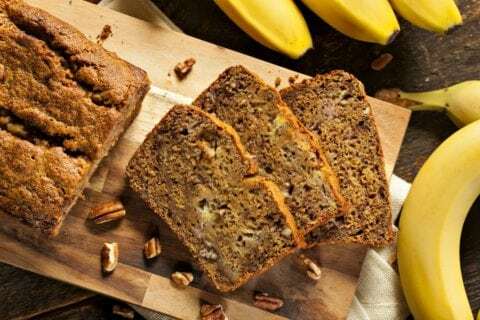 Yet another reason I love bananas!… Even when they’re “old”, they’re completely edible, good for you, and easy to use in banana bread and smoothies. 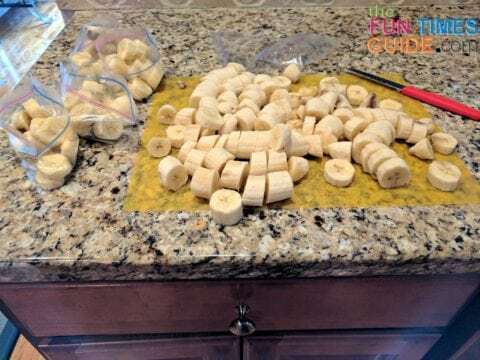 The Easiest Banana Bread Recipe Ever! 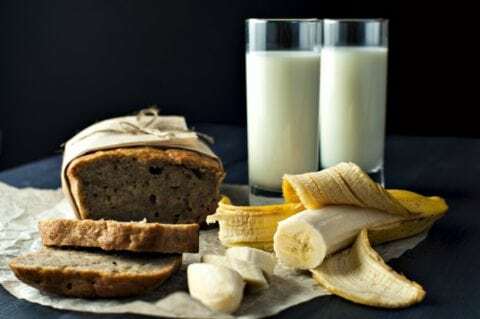 Personally, I think banana bread is more like a dessert than an actual “bread” — because bananas themselves tend to be sweet (especially when they’re overripe). And banana bread has a good amount of sugar in it too. I’ve substituted 1 cup of granulated Splenda for the 1 cup of sugar in this recipe — and it was just as tasty. No one could tell the difference! Lightly mix the bananas with all of the other ingredients — using an electric mixer. 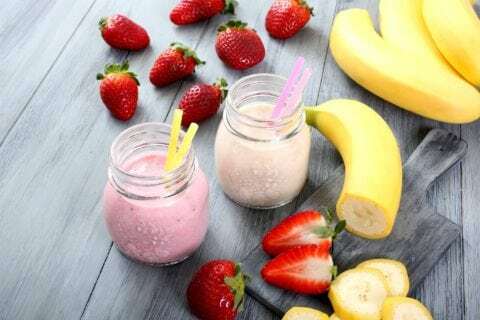 The Easiest Banana Strawberry Smoothie Ever! This is my favorite strawberry banana smoothie. It’s super easy and you can make it be more banana-flavored or more strawberry-flavored — depending on whether you add more of one or the other to this recipe. Here’s more about the origin of this strawberry & banana smoothie, and a few of my tips for making smoothies.